Air Florida 737 in Washington, D.C.
On January 13, 1982, Air Florida Flight 90, a Boeing Model 737-200 series airplane, crashed shortly after takeoff from Washington National Airport, Washington, D.C. 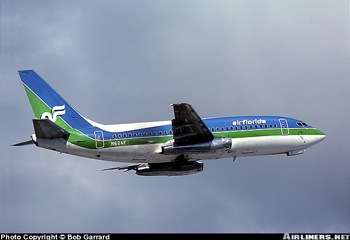 The Boeing Model 737-200 experienced difficulty in climbing immediately following rotation and subsequently stalled. The airplane struck the heavily occupied 14th Street Bridge connecting Arlington, Virginia with the District of Columbia, and then crashed into the ice-covered Potomac River. Seventy of the 74 passengers and four of the five crew aboard were killed along with four occupants of vehicles on the bridge. Loss of control was determined to be due to reduction in aerodynamic lift resulting from ice and snow that had accumulated on the airplane's wings during prolonged ground operation at National Airport. Contributing to the airplane's poor takeoff performance was a significant engine thrust shortfall believed to be due to anomalous engine thrust indications on both engines caused by engine pressure ratio (EPR) Pt2 probes which were believed to have been plugged with snow and ice during ground operation.